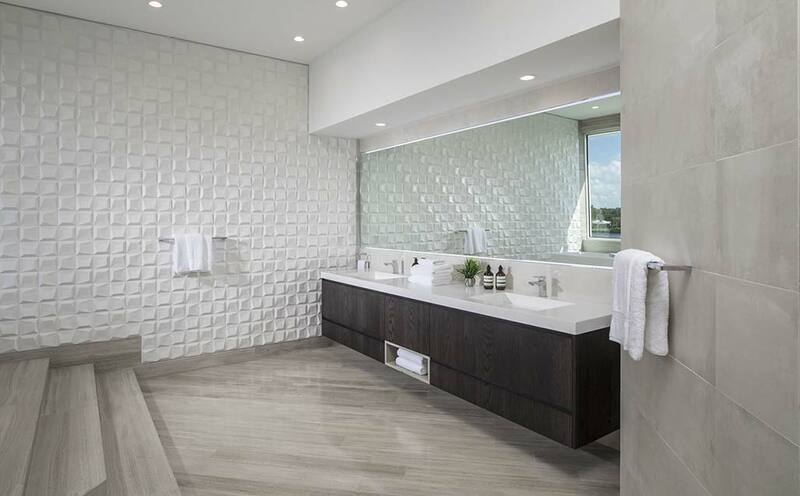 Within the luxury residential community of Gables Estates Club, on the beachfront of Miami, Florida (USA), the sophisticated home designed by the AGD Architects studio is found, in which all companies of the PORCELANOSA Group have participated. In the almost 700 square metres of the home, we can find the noble materials of L’Antic Colonial, the technical solutions of our colleagues at Butech, bathroom fittings and taps by Noken, Urbatek technical porcelain, coverings from Venis and Porcelanosa, the kitchen from the Emotions collection by Gamadecor, and of course, the Solid Surface KRION. We can find KRION within this spectacular project in its most versatile 1100 Snow White colour on the kitchen countertop, as a bathtub, washbasin, and bathroom units.